Cushing, Oklahoma is a major hub for many crude oil pipelines that criss-cross North America. It is also the benchmark price location for crude worldwide. When you hear about “West Texas Intermediate” crude oil prices it is the price posted in Cushing, Oklahoma for that grade of oil. 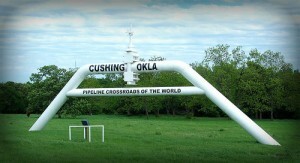 This entry was posted in Energy, Oil and Gas, Oilfield, Oklahoma, Pipelines, Signs on January 23, 2013 by Alan Bates. Its’ been hot here in Tulsa. Especially downtown Tulsa. The main diversion here at lunch used to be dodging the tumbleweeds. Now all sorts of things are happening. 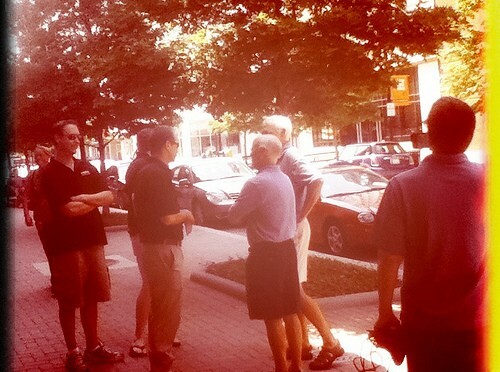 John Sullivan, our local US Representative was strolling the main mall Tuesday with his handlers and body guards and a KRMG radio reporter talking to local voters. He lost the election. So, if he calls you looking for a job, take the call ok? He really is a decent guy, I think voters were wanting change. There was also a demonstration down by the Federal Courthouse. I walked down and chatted with this lady a while. She is of course is against the proposed Keystone XL Pipeline that will be built to take tar sands oil from Canada down to refineries on the gulf coast. She has a lot of concerns about the extraction of the tar sands oil and the air and water pollution involved. 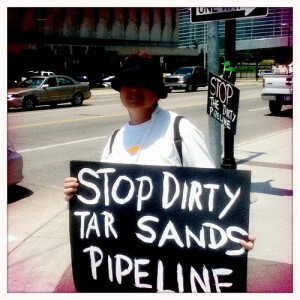 She is also worried about the integrity of the pipeline and potential leaks and the effect on the environment. I neglected to ask if she was a part of an organization. Check out the Natural Resources Defense Council to see what they have to say. She and I parted friends. I’m just glad that she and her friends were taking advantate of their right of peaceable assembly. I walked across the street to see these guys. I didn’t talk to them very much. Anyway, these guys and gals above are from LiUNA, the Laborers International Union of North America. They are for the pipeline for the jobs it will create. 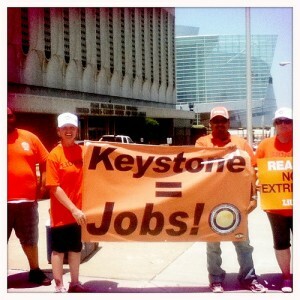 I think the Keystone Project is one of the biggest no-brainers I’ve ever seen. I don’t want to dismiss the concerns of the anti partisians but I think they have been addressed. Energy is what makes our economy go. I would rather get our energy from a close friend and partner like Canada instead of the Middle East. Anyway both pro and anti groups were downtown trying to influence the Army Corps of Engineers who are considering a permit for the Oklahoma leg of Keystone XL. 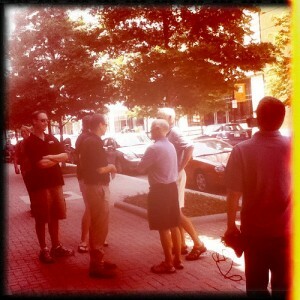 I didn’t want to be the big know it all and tell them that Corps hasn’t been downtown for years. They are in east Tulsa, hunkered down with the IRS behind a big iron fence. I hadn’t had as much fun downtown since the Occupy Tulsa folks last Fall. Tulsa World article on Tuesday’s protests. What do you think? Are you for or against Keystone XL? 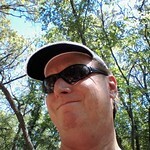 This entry was posted in Pipelines, Politics, Protests, Tulsa on June 29, 2012 by Alan Bates.